Tazbell manages the toll collection services on Ireland's M3 and M4 motorways working on behalf of the operating company, Eurolink under the brand name of Toll Collection Services (TCS). Tazbell initially transferred staff into Toll Collection Services for the M4 operation in 2008. In June 2010, we worked in partnership with Eurolink to establish toll collections operations on the M3 toll road start-up. Working in conjunction with Eurolink, Tazbell recruited, vetted, trained all toll collection staff and worked with Eurolink to develop the standard operating procedures. Tazbell now has more than 60 staff working across the toll roads, including 2 full time contract managers. These toll road contracts represent circa 18m million transactions per annum and circa €45m revenues per annum. Obligations include the selection, hiring and training of all staff required to operate and manage the Eurolink toll plazas and control rooms. Tazbell staff operate the toll plazas, collecting cash and dealing with queries from the public; ensuring that staffing levels are effective to meet the appropriate service levels expected by Eurolink and their agreements with the NRA in relation to plaza throughput and queuing times. Tazbell manages staff rosters, holiday schedules and relief on each site and oversee effective attendance levels. 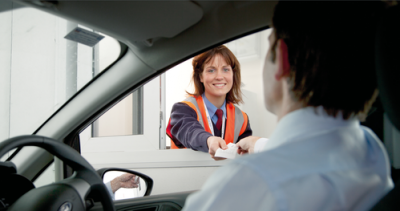 Staff on both toll roads collect and report all manual toll collections in line with Eurolink procedures. TSG assists the collection of cash from the site by the cash-in-transit provider and provides comprehensive reporting on all activities. Tazbell is responsible for the monitoring of both Plazas via the established control rooms, which are attended on a 24/7 basis. In addition, Tazbell is responsible for human resources support services across both toll collection operations including payroll and health and safety risk management. TSG has formal employee engagement representative committees assisting to ensure good communication and cooperation levels between the company and staff. Thought the lifetime of the relationship with Eurolink, Tazbell demonstrated significant transition experience having transferred (via TUPE) staff from an alternative service provider along with a demonstrable start-up and mobilisation capability, having collaborated with Eurolink on the opening of the M3 toll road. Tazbell has exceeded critical KPIs in relation to customer services, cash collections and general toll plaza management this ensuring that the rigorous associated service level agreements are met. Through the lifetime of each contract, Tazbell has demonstrated its capability in the optimisation of service contracts across both unionised and non-unionised environments.